The story of flamboyant Prohibition-era gangster, gambler and bootlegger Arnold Rothstein. receptionist: [answers the telephone] International Tobacco. Yes. Just a moment, please. 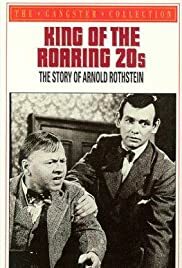 Arnold Rothstein: [Rothstein hands a card to the receptionist] I'd like to see Mr. Simmons, please. receptionist: Oh yes, you're expected. Go right in.
" If you're going places, . . you gotta look ahead "